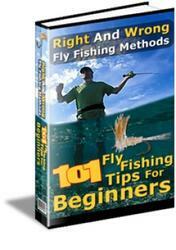 Although not an easy pattern to tie, if the correct techniques are mastered first, the Deer-hair Fry is well within the skill level of most tyers. The key is to come to grips with spinning deer hair. 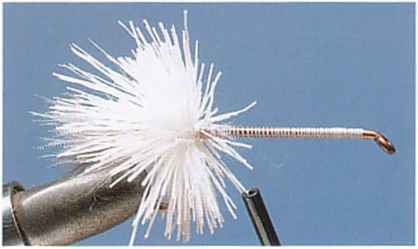 Once the basic technique for tying a Muddler has been understood, it is simply a matter of expanding the process to cover the whole of the hook shank. It is important to add hair in even bunches, and to pack each spun bunch against the previous, so that the consistency of the hair is the same from the bend to the eye. That achieved, it is a matter of trimming the hair to produce a basic fish shape. The color is applied by blending gray and olive waterproof markers together, either with the fingertips or with a piece of paper towel. The decal eyes are attached with a spot of epoxy resin worked into the hair. 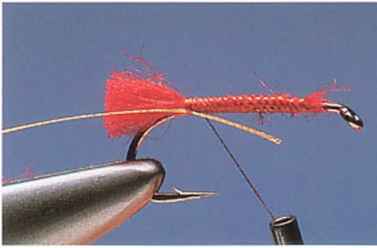 IFix the hook in the vise and run the tying thread on at the eye. Carry it down the shank in close turns, stopping at a point opposite the barb. 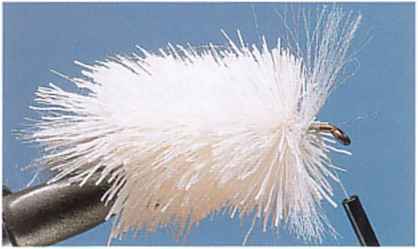 Catch in a tuft of gray marabou and a few strands of pearl Flashabou. 2 Cut a large bunch of white deer hair from the skin and catch it in just in front of the tail using three loose turns of thread. Pull the thread tight, causing the hair to flare. 4 Add further bunches of deer hair in the same manner, packing each bunch back against the previous one to produce a dense effect. With about three-quarters of the shank covered, catch in a length of white Poly Yarn. 6 Trim the hair with increasingly smaller cuts until the body is smooth. Stick eyes on both sides of the head with epoxy resin. Finally, color the top of the body with gray and olive waterproof pens, blending them together with the fingertips. 3 Continue adding turns of thread through the hair, at the same time easing it around the hook shank so that it is evenly distributed. Pull the hair back toward the tail and fix it in place by winding the thread in front. 5 Add one last bunch of deer hair in front of the yarn so that the whole of the shank is covered. Cast off the tying thread with a whip finish and begin trimming the hair into a basic fish shape. Remember not to trim off the yarn.